What subjects did the world's most successful entrepreneurs study? Many of us go through life searching for the magic formula to success; examining patterns and accumulating esteemed advice from our business heroes. However, attempting to replicate others’ achievements is a futile ambition as even an identical journey will lead to a different destination. 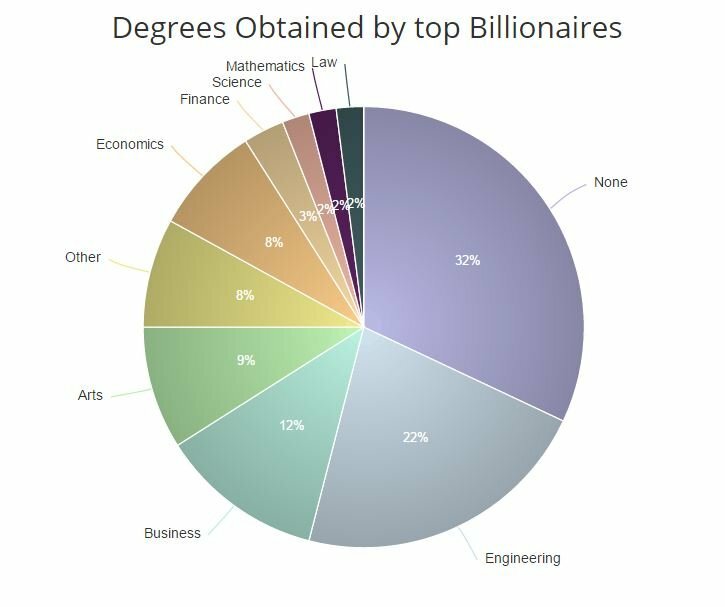 This was yet again confirmed when Approved Index examined the university degrees belonging to the Forbes list of 100 richest people. Intuition may suggest in order to gain business eminence, one would have to attend world famous business universities, be certified Mensa members and operate within a network of powerful and wealthy people. Being born affluent and intelligent certainly won’t hurt, but when measuring mega-successful, top one percentile business geniuses, there is an ‘x-factor’ we can’t quite define. We are all familiar with high profile figures such as Bill Gates and Steve Jobs, who famously shunned university only to go on to become some of the most successful businessmen of the 20th century. What we may have put down to an odd rarity amongst brains we cannot comprehend, turns out not to be quite so rare. Approved Index’s data revealed that an overwhelming third of top entrepreneurs did not study at all. Still, we shouldn’t jump to conclusions as the majority (two-thirds) of the sample chose to attend and complete a university degree before embarking on their chosen ventures. The degrees attained by the world’s wealthiest individuals covered a wide spectrum from art history to medicine. Surprisingly, business was not the most prevalent choice amongst the sample, with engineering being revealed as the most popular degree by almost double any other. 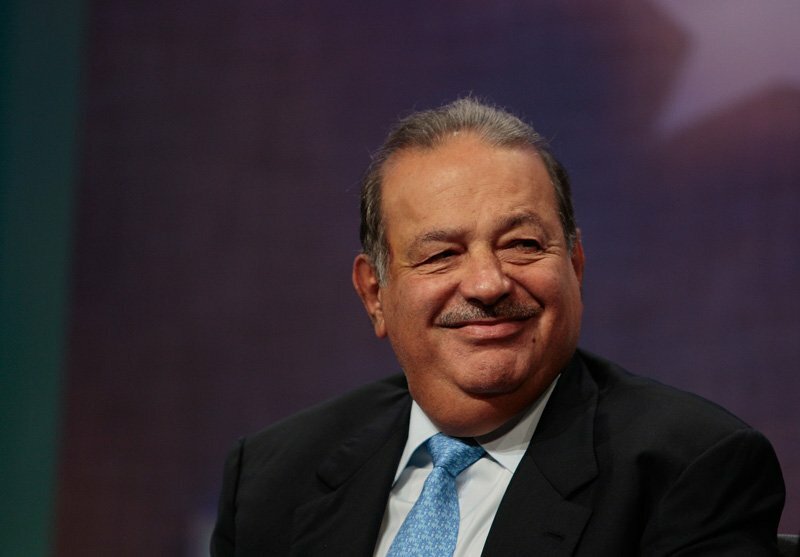 Engineering degrees were held by 22 per cent of the listed billionaires, the most famous and third wealthiest on the Forbes richest list being Mexico’s business magnate Carlos Slim [below]. A civil engineer by education, Slim harnessed and leveraged his mathematical and practical skills learnt during his degree, which gave him a unique advantage in the business world. Perhaps what all of these entrepreneurs actually have in common is a passion for their chosen discipline. Are entrepreneurs naturally drawn to engineering to feed their curiosity in understanding how things work and fit together? Or is it that engineering helps develops an entrepreneurial spirit? Either way, an engineering degree teaches valuable skills and lessons that are bound to be beneficial in business. The degree places emphasis on transforming theory into reality, analysing trends and data and applying it to real world situations, which is a vital ability when launching a start-up. If an entrepreneur is unable to propel a theoretical business plan into a tangible, profitable entity - no matter how great the idea - the business will be doomed to fail. Business degrees came in as the second most popular degree with 12 per cent of the sample opting for this choice. Unexpectedly, Arts degrees came in marginally behind business and just ahead of economics with 9 per cent and 8 per cent respectively, while STEM subjects like science and maths lagged far behind with just 2 per cent each. This data indicates that a variety of skills, spread across multiple disciplines can contribute to creating a unique entrepreneurial edge. Each billionaire on the list has their own personal and distinctive brand of success, developed through a mix of education (both institutional and self-taught), skills, experience and development. But what of this ‘x-factor’, the variable that solves the formula which before refused to add up? Is there an element of luck or is it some intrinsic savvy quality which has insights we can’t see? We may never be able to define what makes some talented, but one thing that this research makes abundantly clear, is that we need to keep encouraging a broad spectrum of degree specialisms and keep minds open as it appears great success can come from any number of subject specialisms. Perhaps what all of these super successful entrepreneurs actually have in common is a passion for their chosen discipline and the freedom to be creative and take a chance on an idea. Nurturing this sort of entrepreneurial spirit is vital to our economy, so we must be willing to encourage all sorts of learning and support a multitude of different mindsets, even though most of us won’t become the next Mark Zuckerberg. Success is all relative anyway.